My local post office is always curious when I start getting in boxes as they know I am always up to something charity related. Just for kicks, I decided to open a box of one of the Mad Hatter Challenges that we had received. I shared with them our goals and challenge that is on going for Creativ Festival. If you wanted to see the look of shock and gasping… you should have been there. I opened the box with a lot of pride as all of the hats have been the most creative ideas I have ever witnessed. I am dying to show our audience as a whole but cannot give an advantage by previewing hats that are being submitted. This is about being the most creative to win 1 of 5 – $500 gift prizes. 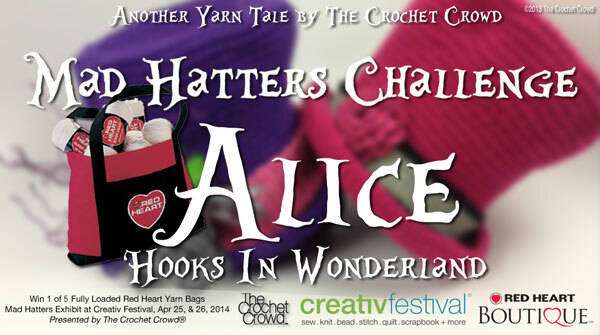 I have to say, the Happy Hearts Afghan Challenge and now the Mad Hatters Contest has blown me out of the water. With each Mad Hatter Box I am opening, I am speechless and looking at the hats exploring elements of the hats with the biggest smiles ever. We leave them on our Dining Room Table to admire for a few days before taking them to the studio to photograph. Has something changed? Are people having less fear to play with ideas? Is it the challenges themselves or are we seeing crocheters really strive to explore the wonderful world of creativity? It is my hope that when I release the final pics of the Mad Hatters Challenge that our audience take their time exploring and looking at the elements of the hats. Grab a cup of tea and just slowly go through the photos. You will be inspired beyond belief! Sorry, no sneak peaks… I will just say… you will NOT be disappointed and maybe be in awe in what can be done with yarn and mixed media! This entry was posted in Crochet Challenges and tagged Challenge, Creativ Festival, crochet crowd, Hat, Mad Hatter, Mikey, Top Hat. Bookmark the permalink. 16 Responses to Is Something In The Water? I See Our Crocheters Growing! I’m really having second thoughts about even sending mine to you. The more I look at it, the more “boring” it looks to me. My daughter thinks it is cute, but I’m afraid the rest of you will think it is just pitiful. If it is too awful when you receive it, Mikey, I give you permission to put it aside and not include it. Don’t be so hard on yourself. Think of it this way: more hats for the display means more hats that have the potential to support a scholarship Mikey wants to do. Sending your hat in helps Mikey. Thanks for the encouragement. I did send it off on Friday. And I started on another hat to “appease” for the boring hat. I don’t care at all about winning anything – I just didn’t want Mikey to be embarassed! I do appreciate your kind words. Of course, your followers are growing! I tell everyone about your talent and how much fun it is to be a follower…..I hope someone makes a hat with an octopus for Dan this time!!! I still have images of him with the octopus from last year’s big challenge. I love you all….God Bless You as your following grows and grows! I am so frustrated I was super excited about doing this and I have started it but life has been throwing all kinds of stuff my way so I haven’t been able to finish it and don’t know if I will in time to send it in!! I cannot wait to see all of these. I so enjoy see other people’s idea and it always inspires me. I have been crocheting for less than a year and just mailed my hat in today! I am really proud of what I accomplished but I know there will be some stiff competition! I really want that yarn ball winder!! I am holding out on buying one until after the contest is over, just in case I get lucky and win! No One is a looser in this contest, it’s a win win all around. Helps with the Scholastic Program. Nice to see this has helped you over the negativity that you have experienced over the last while. You now have something very positive happening which I am so pleased to see you get! You want to help every one in that big heart of yours. Kudos for still caring and worrying about those trying to find their way. You are now seeing the results of those that grabbed with both hands a wonderful challenge you gave them.. Wishing you many more years of continued challenges that bring both spectrum’s of the senses of over the top accomplishments and some lows where you realize you just can’t help every one. Sounds wonderful, I am in the mist of working on mine. I came up with an idea right after reading the challenge and can’t wait to get it finished and see how well my imagination and the final project come together. I also cannot wait to see what everyone else has been working on. Thank you so much for this awesome challenge. I saw several of the hats people made when the pattern came out and loved looking at them but never even considered making one as I have a list a mile long already. When you proposed this challenge I thought about it but wasn’t really interested in having it to deal with after the challenge… But wait, you wanted them mailed in, so I read further, I wouldn’t get it back and it would go for a scholarship? Wow a way to pay Mikey back ( a little) for all the videos that answered questions I didn’t even know I had. So I did one for you and the crowd, Mikey. My daughter as forewarned me,,, any hat I make for the Mad Hatters Contest shall be shipped directly to her! She is my Alice in Wonderland girl! I can’t wait until I learn enough to enter these types of contests. I just started loom knitting and crocheting in January and am trying to learn as many new stitches as possible. I am not doing too bad, have raised $75 for my daughters’ upcoming trips (after cost). I can’t wait to see the resulting hats!